Great! Feel free to come back here and leave a comment on what worked / what didn’t after your meeting! It’s really exciting to see these patterns filter out. I’d like to hear more about how the participants react to the idea and the kanban in a meeting. We’re finding that people respond enthusiastically and immediately. Thanks for your feedback and commetn! I agree with you that participants respond immediately (not so sure about ‘enthusiastically’ – the responses vary from cautious acceptance to more strongly positive at first). I liked your posts on the topic. I like that the point that you raised about how being over-controlling can mean that some meetings remove the opportunity for flowing conversation which is often the very value that most meetings are meant to deliver! I do have some questions about setting the time-limit on the topic. I noticed in the group I worked with today they awareness of the time limit lead to some “talk faster and louder” to fit everything into the timebox that was agreed. I haven’t yet seen someone propose mid-timebox to extend the time available to the topic – I’m wondering whether this wouldn’t be more effective (e.g. if you really think a topic will need longer than the current time limit, instead of talking quicker and trying to stuff the points in, state your issue with the group and propose a time extension). I’m curious to know if you’ve seen any behaviours on this level emerge in groups? In the light of workshops, wouldn’t this only be applicable if the entire group is of the same level/have the same interest in learning something particular? Also, I’m assuming they get to choose what to learn. Thanks for leaving a comment. Can you say more about the concerns you have if this approach was used with a group with a different level of ability or interesting in learning? I think there will always be a distribution of ability and interest in learning in any group (or meeting) and this approach allows those differences to be aired (e.g. different people may want have different topics – in this approach at least people can say so and a decision making approach – such as voting – can be used to work out a way to move forward. I’m not sure if I’ve understood your point though, so please come back if I’ve misunderstood or you see it differently. In terms of choosing what they get to learn – this can vary. In some situations I could imagine that the workshop leader may have good reason for wanting to cover certain material in a particular order – in which case I think it is a good idea to start by placing those topics in the ‘to do’ column in the order the leader thinks if best. However, by giving the participants a choice to add, remove or shuffle the order, it allows the leader to find out if others see it differently. If so then there can be a discussion where each ‘side’ can explain their reasoning and ask the other to point out if they see inconsistencies in the reasoning or have a different view. In general my view is that people learn best when they can choose what to learn, based on what they want to know, in the form and at the time they find most useful. The group then decides whether or not they are satisfied with the topic and move on. In workshops this can be a great way of actually finding the level of the group as a whole, or if there are splits between group members. If the group is divided between skill sets, and if that gap is fixable by some quick lessons, you can divide the group up and have the advanced members teach the less advanced. Then bring everyone back to discuss entirely new material. Thanks for sharing Benjamin. If only I saw this a week ago I could have used it on my presentation. Will try it out in the coming weeks. I also liked your cover notes in your email (I’ve pasted them below). Also, it gave client’s a direct experience of what it’s like to only plan the next most important to talk about, to define the acceptance criteria before we start the topic (“Now that we’ve chosen topic X, before we start talking about it, what are the key things you want to cover?”) and to practice testing the exit criteria before we move on to the next topic (“Now that we’ve come to the agreed time limit, are we finished discussing this? What are your views?”). I’m contemplating adding another exit criteria around “Are there any actions that have come out of discussing this topic that we need to record?”. Thanks for leaving a comment and highlighting the parts you found useful in my e-mail. Yes, I like the idea of asking “Are there any actions to record as an outcome of our discussion on topic X?” as an additional exit criteria. 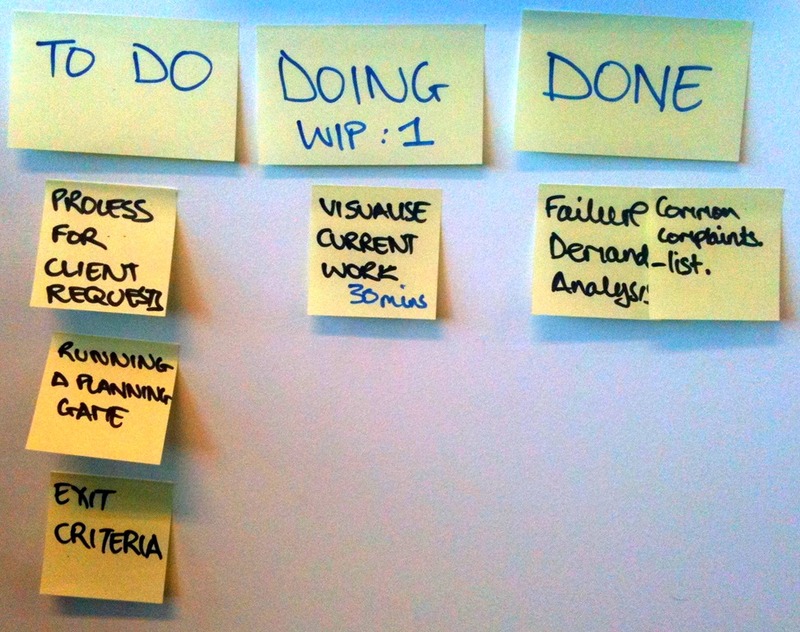 I did this on Friday with a client and used an additional column on the right of the board to record “actions”. I’ll post another blog incorporating this point later in the week (hopefully with some additional things I learn fro using this approach again with clients this week). Let me know more about your experiences too! 1) Is this something you would post publicly for meeting participants to rearrange prior to the meeting, or would you augment the board with participant suggestions at the start of the meeting? How have you handled politically contentious or otherwise weighty topics that attempt to overrun the meeting by sucking up the majority of the time? Have you ever found that this foments discussions about the process (participants arguing about ‘what’s next’ as opposed to spending that time on the topics)? 4) Do you collect the exit criteria (points to be covered) on the notes, or elsewhere to be sure they are met? I like the idea of the rightmost ‘action’ column – all my meeting summaries have a spot for ‘actions’ stemming from the meeting. Thanks for leaving a comment. I think my updated post may be helpful in providing more background. I don’t have hard and fast rules, but would encourage you to connect some of the questions you ask with the purpose of the meeting. 1. Giving the topics ahead of time might be useful, if that’s your context. 2. I’ve modified the need to write a new card, and just left the existing card in place (it felt like too much mechanical overhead to write a new card) and update how long we’ve been going on that card (e.g. “2m + 2m” indicates a topic that we said we’d spend 2 minutes on and then continue for 2 further minutes). I haven’t had an issues with “politically contentious or weighty topics” yet. Sometimes if there was a larger topic I’ve encouraged no more than 25 mins (a pomodoro) to start, and frame the time limit as an opportunity to “see where we are, see if we are clearer about the potential outcome we want”. Ensuring that a timing devise (the timer on my iPhone) go off on the time limit, sort of forces this, without personalising it. If the group continue to talk but don’t make a decision about how much longer, I’ll say “I’m unilaterally giving this an extra 5 minutes” as a way of allowing it to continue but signalling another review in 5 minutes. 3. I haven’t had too much of an issue with arguing about what’s next. If there’s no clear agreement and we need to think about it, there’s an option to just make that the current topic “deciding what to do next”. Because the topics tend to be small, this means there are many opportunities to re-order or add topics so it tends to reduce the pressure. People are OK with starting a topic for 10 minutes and knowing they can make another decision 10 minutes later. 4. I’ve added the action – see my updated blog post. Let me know if there are any further questions or if I can clarify something further. I’d encourage you to try a meeting like this yourself and report back your results.